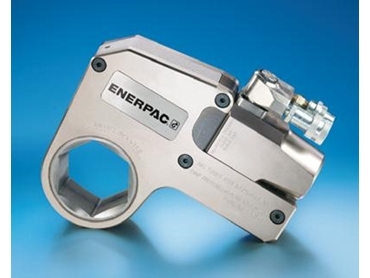 Enerpac (A Division of Actuant Corp) introduces a new line of swivels for use with its 700 bar hydraulic torque wrenches. Compact high pressure hydraulic torque wrenches are widely used for powerful and precise tightening and loosening of nuts across a broad range of industries. Hydraulic torque wrenches are used across industries as diverse as building and construction, infrastructure fabrication, manufacturing, mining and energy, petroleum, heavy transport, primary industry machinery, shipping as well as water and wastewater. However, limited access can sometimes restrict the utility of these tools with users having to frequently deal with tight tool fits in applications such as pipelines, tanks, pressure vessels, mobile machinery, drilling rigs, tracked and heavy vehicles as well as cranes and fixed plant machinery. Enerpac’s TSP Pro Series swivels are available for its internationally renowned series of 700 bar square and hexagonal drive torque wrenches. Available as an OEM item for torque wrenches specified with the feature or as a retrofit to existing tools, the TSP Pro Series swivels feature tilt and swivel technology that simplifies hose placement by offering 360º X-axis and 160º Y-axis rotation. This feature extends the versatility of Enerpac’s W low profile hexagonal wrenches to low clearance bolting applications, which weigh in the 1.4-12kg range, yet have terrific and precisely repeatable torque in the 2712-47450 Nm range. It is equally applicable to Enerpac’s versatile S series of double-acting square drive wrenches, which extend from 2.7kg to 31kg with outputs of 1898-34079 Nm. According to Enerpac Australia and New Zealand Regional Manager Tony Brooks, the rigid steel torque wrenches with excellent power-to-weight ratios are not standalone products but form part of complete families of advanced bolting and fastening technologies to handle tough jobs onshore and offshore. Enerpac is a major supplier of high-pressure hydraulic equipment in Australia and New Zealand with products such as 700 bar precision hydraulic cylinders, tools and safety equipment in addition to professional bolting technology.